Need to find an installer? Line and protect with sprayed ceramic technology. Thermocrete® is a premium, durable ceramic liner for use in the repair, restoration and energy conversion of chimneys and chimney flues. Thermocrete seals holes and cracks, increases efficiency, and strengthens the chimney. 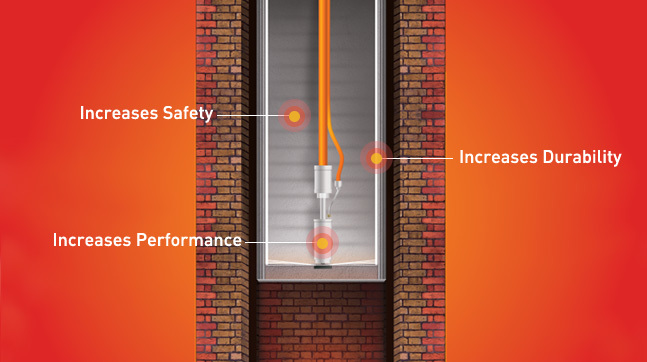 Thermocrete makes it easy to retrofit chimneys for conversion to natural gas. Installation is quick, cost effective and environmentally friendly. And unlike traditional fuel conversion methods, Thermocrete requires no major construction and does not reduce the diameter of the flue. Ceramics will not corrode like stainless steel. Thermocrete was listed with Warnock Hersey in 1999, then relisted in 2011/2016 by Guardian Test Labs per ULC-S635. Affordable and easy to install, Thermocrete has been the top choice by many commercial buildings. Suitable for any type of commercial applications built of brick and mortar and clay liners. Thermocrete was listed with Warnock Hersey in 1999, and relisted in 2012 by Guardian Test Labs per ULC-S635. Designed for all types of masonry chimneys. Thermocrete is effective and ideal for restoring and repairing residential fireplace chimneys, as well as chimneys serving gas, oil, wood, or coal burning appliances. We are always seeking to expand our network of Thermocrete factory trained Installers. If you are a skilled chimney professional who has found situations where other repair methods just won’t work due to the configuration or size of the flue, contact us to learn more about how you can offer your customers the Thermocrete solution. 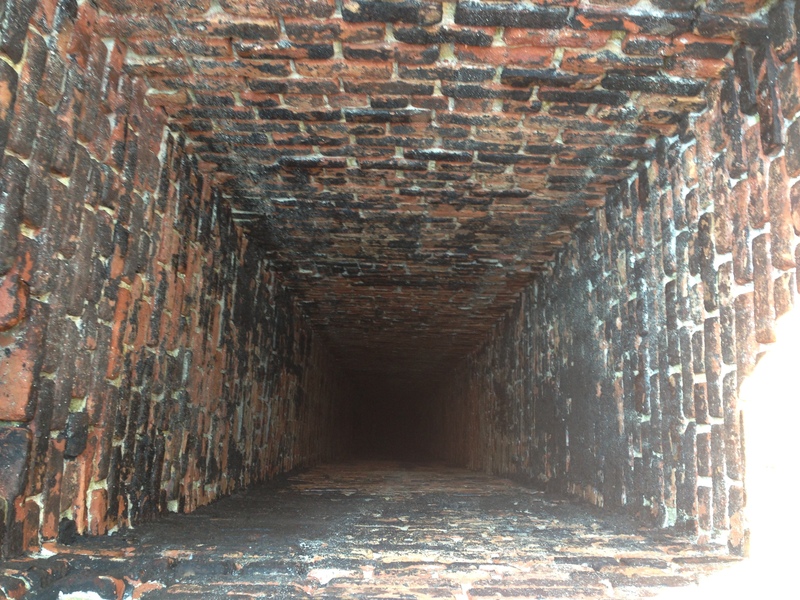 A commercial chimney with round sectional clay liners. Download a PDF of the Thermocrete Technical Data Sheet. 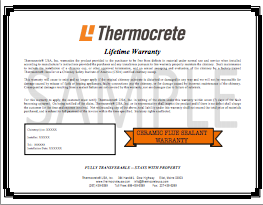 Download a PDF of the Thermocrete Warranty Certificate. *Approved Industries, Inc. defines the USA market only. Thermocrete used in Europe is not covered by warranties issued by Approved Industries, Inc.
1. 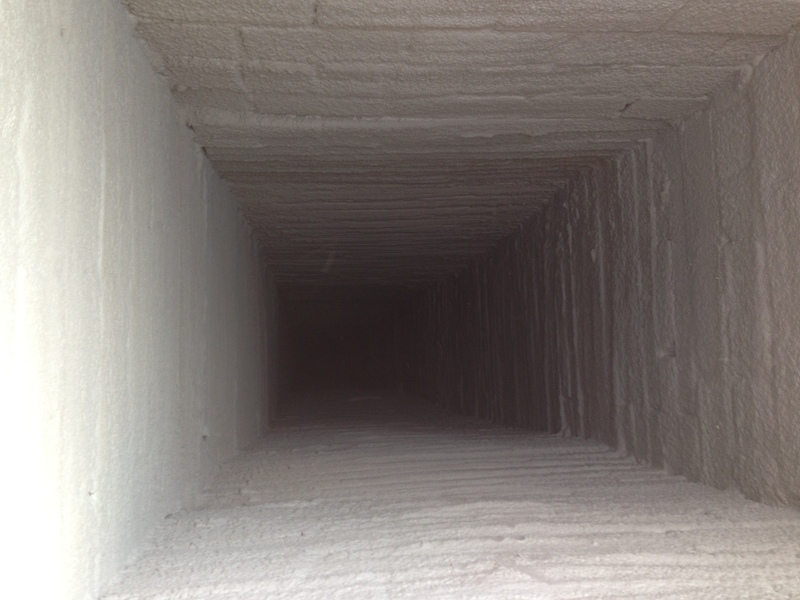 Can any chimney professional use Thermocrete Ceramic Flue Liner? 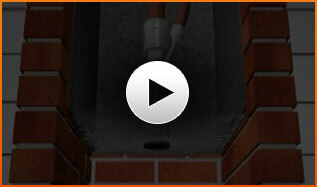 Thermocrete Ceramic Flue Liner can only be installed by a factory-trained technician. All installers are required to attend a comprehensive Thermocrete training program. Each applicant is thoroughly screened prior to being accepted into our training program. 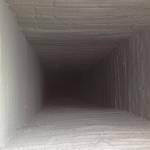 Companies seeking certification bring their team of experienced chimney professionals to our facility for three days of intensive training on specialized equipment. After successfully completing the training, they receive official certification, assuring you that they are an authorized Thermocrete installer. 2. 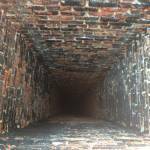 Can Thermocrete repair a chimney-fire damaged tile liner? What are the limitations? Yes, Thermocrete does repair heat-damaged clay tile. 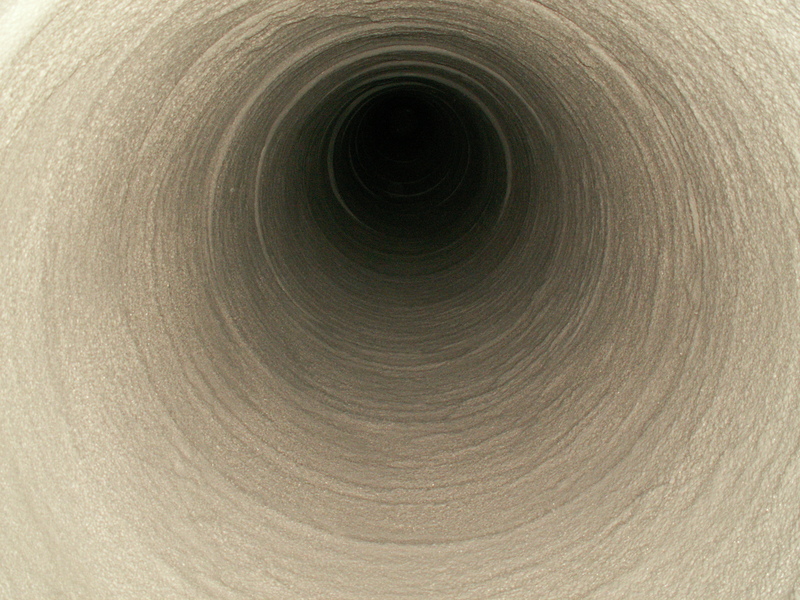 It fills cracks, binds tile together, closes eroded tile joints, and provides a heat-diffusing barrier that renders the total liner better than it was when it was first installed. Tests show that a Thermocrete-repaired broken tile liner is gas-tight, remains intact during normal (sub-1200F) use, and is 99% less likely to re-crack during elevated chimney-fire temperatures of 1200-2100F. Thermocrete will fill normal masonry joints, but for fire-damaged tile repair, only liners with no more than 1/8″ cracks be candidates for Thermocrete. If tiles are broken apart, loose, or missing, you can’t use Thermocrete. If tiles have holes larger than 1 inch in them or gaping cracks, you must not use Thermocrete. 3. What about the need to downsize for many gas and oil applications? This is an occasion that would require a different type of liner than Thermocrete. The advantage of Thermocrete in most cases is that it does NOT substantially downsize the flue. 4. 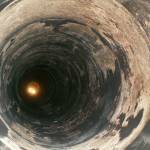 Is Thermocrete a zero-clearance liner? 5. Has Thermocrete passed any official tests or certifications? What about U.L.? Yes. Thermocrete has undergone extensive testing by Ceram Research and Warnock Hersey / Intertek Testing Services. It was originally listed to the applicable sections of UL 1777 by Warnock Hersey in 1999 (#J99001572-231) then reevaluated, listed and labeled by Guardian Fire Testing Laboratories in 2011 to UL 1777 and ULC S 635 as a liner for Gas and Oil(GL90811/FI19311). Thermocrete is also in compliance with NYS Building Code MC 801.16, item 3 and FGC 501.12, item 3. See the Thermocrete technical data sheet for more information. 6. How will Thermocrete stand up to brushing during chimney cleaning, especially with flat-wire brushes? Thermocrete stands up very well to normal chimney cleaning. No special care is needed during cleaning. Although Thermocrete is 5 times harder than cast-in-place liners and it has a remarkable capability for bonding firmly to chimney walls, however we do not recommend the use of rotary chains. 7. How does installation of Thermocrete work in cold weather? The problems you may encounter in cold weather are primarily related to the application process, not the finished product. Whenever you are dealing with water in below-freezing conditions, there are precautionary measures that need to be taken, however, if done properly, Thermocrete can be sprayed in weather as cold as 20 F.
One of the benefits of Thermocrete is that a few minutes after the end of spraying, many heating appliances can be fired to complete the cure, with no worries about plummeting nighttime temperatures. 8. What about creosote wicking through tile liner cracks and remaining a hazard on the backside of existing tile? 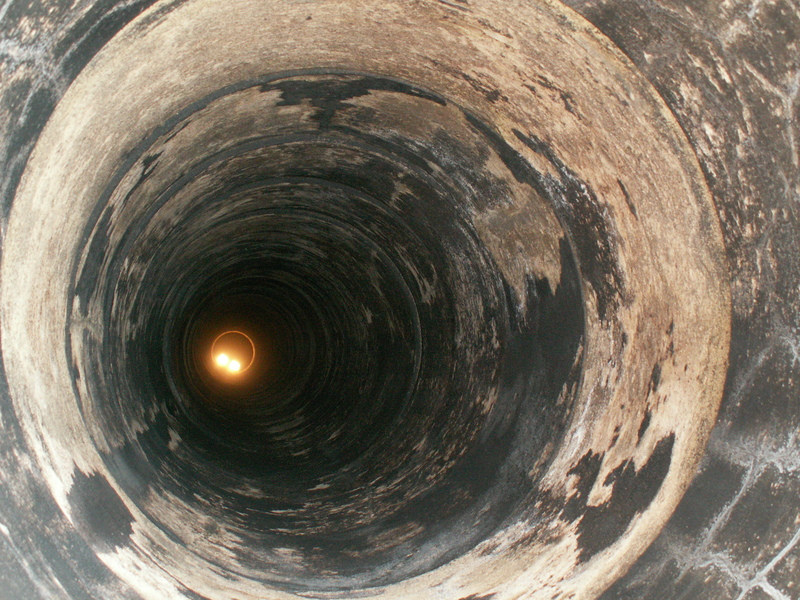 Actually, the quantity of creosote that works its way through small tile cracks is inconsequential. We have never seen a dangerous quantity of creosote on the backside of minimally cracked tile. With a liberal coating of Thermocrete in place, hot gases cannot penetrate the repaired tile to reach any creosote film. Thermocrete provides a heat-diffusing barrier to minimize temperature rise on the back side. 9. How about eroded and spalled tile liners serving oil and gas appliances? Thermocrete is excellent in this situation. Since Thermocrete is only as good as the substrate it is applied to, you should brush and peel away all loose liner materials first. 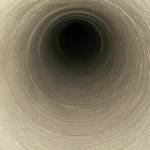 The liner should generally remain, at minimum; 3/8″ thick at most spots. Any holes should be backed closely by masonry walls or filled with refractory materials. The Thermocrete coating will then strengthen and bind together the old surface with a new acid-resistant and moisture-resistant seal. © Approved Industries 2014. All Rights Reserved.